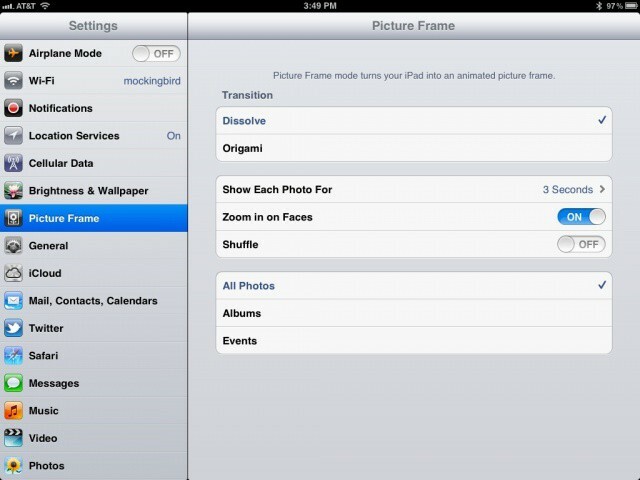 The iPad has a pretty slick feature that you can access when it’s in the locked state. If you look to the bottom right of the lock screen, you’ll see an icon that looks like a picture of a little flower. Tap that and your iPad will start a slideshow of all the photos it has onboard. The default slideshow is fun, especially if you have your iPad up on display, but you don’t have to settle for the default settings. Today’s tip shows you how to change them to your heart’s content. Wake up your iPad and tap on the Settings app icon. Once there, tap on the Picture Frame settings tab in the left panel and you’ll be treated to all the options for this feature. You can choose to have the photos Dissolve from one to another, or show several photos at once, transitioning like a flip-book. You set the time for each photo to be shown on screen to 2, 3, 5, 10, or 20 seconds at a go. You can turn on or off the Zoom in on Faces option (only available when the Dissolve transition is in effect) as well as toggling a Shuffle function. You can even tell the Picture Frame to show All Photos, specific Albums, or Events. IN the case of the latter two, tap the category you want to sort by, and then check or uncheck all the albums or events that you’d like included in the slideshow. To stop the photos, simply tap on the screen and Slide to Unlock, as per usual.